Sept. 2, 2018, at Freshwater Lagoon. Sometimes a creative urge will drive me nutty unless I can find a way to make something. I’m an artist but I am only interested in one medium: photography, which of course includes working with photos after taking the picture, whether with current digital tools or in the darkrooms of old as I started out. At the moment I am driven to take nighttime photos. I don’t know why. I just go with it. But it can conflict with my highly developed inclination toward self preservation when it comes to places I don’t feel safe to be alone at night. There are times when I want terribly to go photograph but can’t find anyone to accompany me. Family and friends are wonderful companions, and they have given me many of their nights to come out with me to make long exposures or paint with light in the dark of night. I am grateful for the time they’ve given me and for the times yet to come. Thank goodness for them. My problem is that I want to go out more often than all of them combined. I don’t blame them at all: It’s dark, what are we doing going for a hike? So I run out of people. At those times I wear a groove pacing in my mind. We stood on the shore of Freshwater Lagoon and watched the sky. Car lights sped by on U.S. Highway 101. Mars shone brightly in the clear sky. The Milky Way rose before us like a great pillar and a satellite crawled up its length. We felt very small in the big scheme. Sept. 2, 2018 in Humboldt County, California. Sometimes my wife comes with me. It has to be an emergency, a time when there isn’t anybody else and I just have to go out or else. She’ll see I’m going to burst and takes pity, I suppose. One of those nights was Sept. 2, 2018. I couldn’t let another night go by without making an image. It was a Sunday and she let me drag her up to Freshwater Lagoon where I had in mind an angle for a nighttime photograph. I didn’t find the shot I sought. It was going to have the … well, I’ll have to show you another time. Things didn’t line up how I’d thought for the image I had in mind and we didn’t want to be out late, so instead of exploring in the dark I took a couple photos where we were and called it a night. The best one was the one of us. 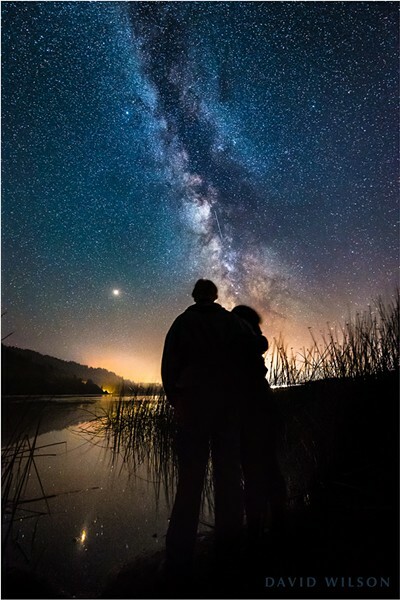 We stood together among the reeds on our tiny part of the planet, looking out over the lagoon and into the vastness of space, past Mars and through the cosmos, and though we were very small, we had each other and we were happy.